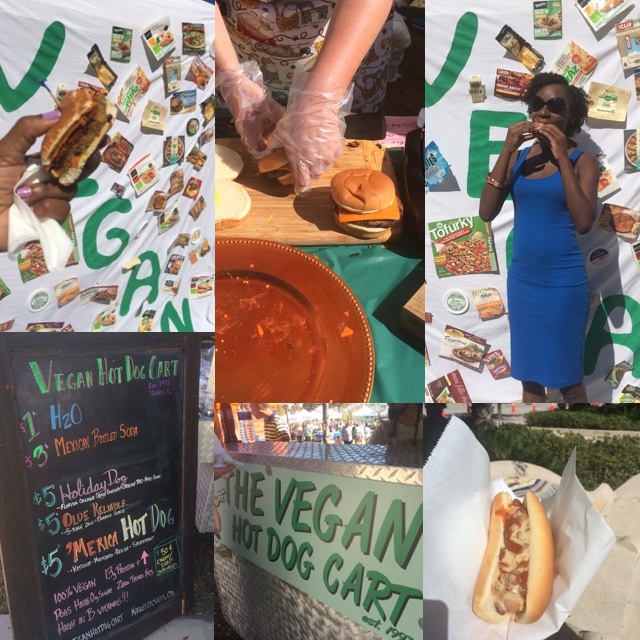 This was my first time at a vegan festival. Earlier this year I volunteered my time at a food festival and I wondered about other kinds of festivals. 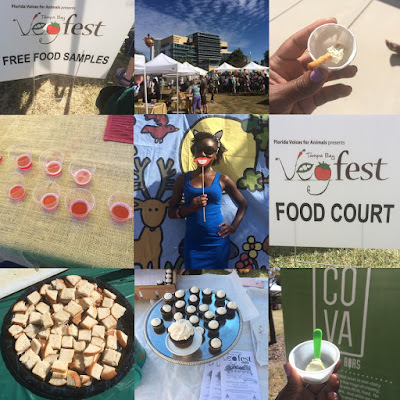 A quick search led me to the Tampa Bay Veg Fest. 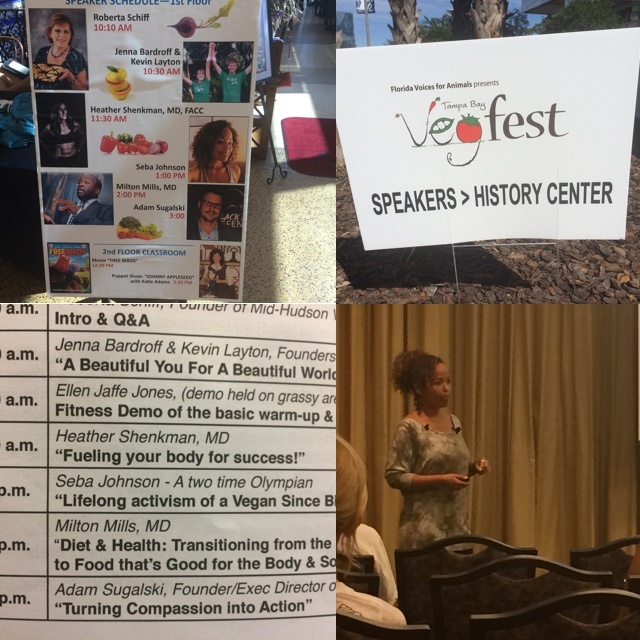 This event is listed as one of the 10 must attend veg festivals in America. With that kind of information on hand my veg-curious self started making plans to attend. 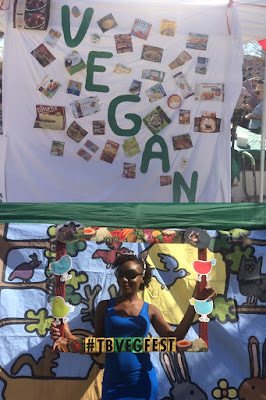 I was a vegan for a day. This event was packed with cooking demos, music, speakers, animal rescue stations, and raffles to win amazing prizes. Take a look at my "cluelessness". There were so many vendors offering all kinds of dishes/drinks. I was able to sample "ham and cheese" sandwiches, kombucha, cupcakes, flavored cheese, and ice cream. The frosted lemonade from Cova Bars blew my taste buds away. It was delicious! The base is made with avocado and coconut. I also had a free sample of a vegan burger. Once I was done with that I went over to the hot dog cart. This vendor stayed with long lines. I passed by several times saying I'll wait 'till the lines get shorter. It never did so I stayed in line just in case they run out and purchased the Olde Reliable (5 bean chili with cheese sauce). What I liked about this event was I saw a lot of people that looked like me in attendance. Not just as attendees but as vendors, volunteers, and speakers. Oooh Weee, I lost count (don't judge me) and that put a smile on my face. I thought I was at a natural hair show with all the fros I saw. Anyways, one such speaker that I was able to hear speak was Seba Johnson. Seba shared her story of being a vegan since birth, the racism she experienced as the first black and youngest skier (two time Olympian), and an animal rights activist. She's what you call an ethical vegan. She spoke about how she was disqualified from a competition because she refused to wear a ski suit that had a piece of leather sewn into it. She also qualified for another race but chose not to compete because of the whale hunting going on in Norway. That's some serious dedication to the cause right there. There was a doctor who had a presentation right before Seba's and I was able to catch a few minutes of it. She spoke of how she doesn't like to use the word "vegan" with her patients. She's a vegan and I thought that was interesting. I had a great time at this festival. I went home armed with knowledgeable info to help me on my journey. Especially, when it comes to food. I knew this was going to be the hard part so I'm not surprised. Like most people I grew up eating meat and this is new to me. I've already made the switch to coconut milk and dairy free butter. It was something I was able to do on my own. However, it's going to be a very slow transition with other areas. I've reduced my consumption of eating meat but I honestly don't see myself being a 100% vegan. Who knows... I might surprised myself later on. Anyways, I look forward to more of these events in the future. Have you heard of the term flexitarian? I don't eat any milk products because of my dairy allergy. I've been slowly reducing how much meat I eat over the past few years. While I doubt I'll ever go fully vegan, there is something to be said for eating a plant-based diet most of the time while also leaving room for the occasional meal that features animal products. I love the flexibility of it. Sometimes it's tough to find any vegan or vegetarian options, especially when you're travelling or spending time with people who eat a very traditional diet. In those cases, I don't have a problem eating meat. But it's not my first choice when thinking about what to have for dinner. Oh yes! I've heard of the term and have a post on it. I consider myself one. Thanks for sharing your story.